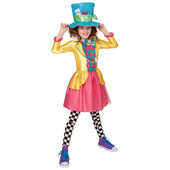 Tween Madeline Hatter costume includes a pretty multi-coloured dress with bow detail and a printed necklace. To complete the look a pair of polka dot tights are also included. 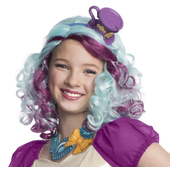 Please note that the gloves, hat, and wig are not included but may be purchased separately. 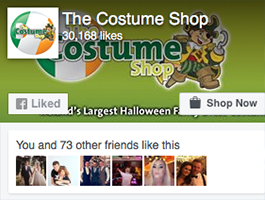 Costume is also available in smaller sizes in our kids section. Please note that the sizing on packaging is also shown in American sizes. Got the size 10-12 for my tall 9 yr old daughter for her birthday last week, it fitted her perfectly and she absolutely loves it.